SAM MOORE HONORED WITH TRAILBLAZER AWARD | 2911 Enterprises, Inc. 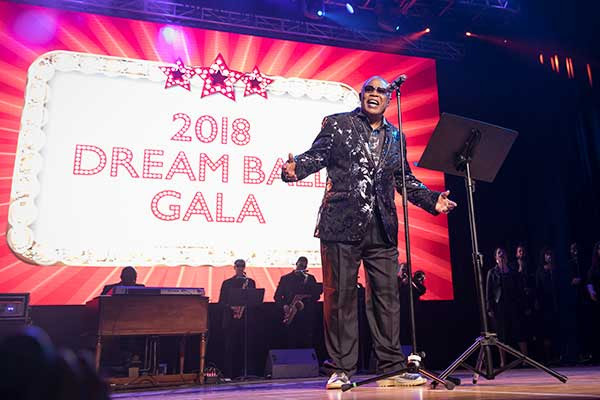 The Legendary Soul Man™ Sam Moore was honored with the Trailblazer Award at the annual Dream Ball Gala on Monday, February 19 at the Bomb Factory in the Deep Ellum area of Dallas. The gala is produced by Nancy Lieberman Charities, a 501(c)(3) organization that promotes healthy lifestyles and educational opportunities for young girls and boys, and is dedicated to expanding and ensuring that educational and sports opportunities exist for economically disadvantaged youth. Moore was presented with the Trailblazer Award by former Dallas Police Chief David Brown, and also performed a short set during the program, garnering rave reviews. Fellow honoree Billy Crystal was joined by Bo Derek, Tony Dorsett, Deion Sanders, Jose’ Guzman, and Spud Webb, among other celebrities and local dignitaries, who were also in attendance. The Dream Ball Gala is one of several annual charity events organized by Nancy Lieberman Charities. On March 31st, Sam Moore will take part in the Arizona Diamondbacks’ opening season festivities to help celebrate the 20th anniversary of playing baseball in Phoenix. Moore, who also was part of a group that sang the National Anthem on Opening Day in 1998, will perform the Star Spangled Banner before the opening of the game against the Colorado Rockies, the same opponent as their first game twenty years ago. Legendary Soul Man™ Sam Moore’s Grammy award-winning voice has been heard around the globe, across multiple music genres connecting audiences of all generations for more than 60 years. Sam Moore found musical fame as one half of the ’60s powerhouse duo Sam & Dave. With 1967’s hit “Soul Man,” the duo found lasting fame, defined a genre, and altered the course of music history. Their signature sound influenced a diverse array of musical talents, including Al Green, Michael Jackson, Lionel Richie, Tom Petty, Phil Collins, Elvis Costello, Billy Joel and so many others. Sam & Dave’s music and personas inspired the film The Blues Brothers, and other hits like “Hold On I’m Coming” have appeared on the soundtracks of more than a dozen films. Moore, 81, continues to record and perform to critical acclaim as a solo artist and as a guest performer for dozens of his musical friends. The Legendary Soul Man recently accepted a position as Artist in Residence at Florida International University as part of the College of Arts, Sciences & Education Humanities Project. NLC is a 501(c)3 organization funded by charitable donations and committed to promoting and developing healthy lifestyles and educational opportunities for young girls and boys. NLC is dedicated to expanding and ensuring that educational and sports opportunities exist for economically disadvantaged youth. Approximately 85% of the students that we serve with our basketball camps, clinics, Dream Courts™, college scholarships, and school supply programs, throughout the United States, are from low-to-moderate income families. To learn more or to make a donation, please visit nancyliebermancharities.org.